Posted by Dr Dog. June 8th 2018. It can be worrying if your pet develops lumps and bumps on their skin. They can show up unexpectedly and leave dog owners worried that they could be related to serious health issues. Our guide on lumps, bumps and skin tags on dogs should assist in what to do if you find any. Lumps, bumps and skin tags on dogs are common. Your dog is likely to have many under their fur that will often go unnoticed. While they are sometimes a little unsightly, they are not normally a sign of a possible health issue, however, it’s always good to be aware of them just in case. While these growths can be harmless, you should ensure that they are not a sign of something else. Ticks can cause health issues such a Lyme disease and should be removed as soon as possible. Our blog has more information on these parasites. Warts should also be treated, as they are contagious to other pets and can lead to further health issues such as tumours or bacterial infections. 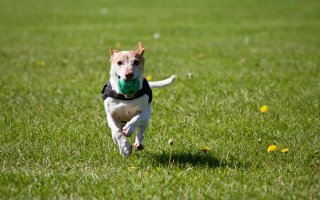 What causes bumps and skin tags on dogs? Parasites: Fleas, lice, mites and ticks can attach themselves to your dog. This can result in inflammation or other skin damage in the process. Ill-fitting collar: A common cause of growths or skin tags on dogs is a badly fitting collar. Make sure it does not rub against the skin. This can cause irritation to the skin and it can also cause discomfort to your pet. Improper skin care: Make sure your pooch is bathed or taken to a dog groomer on a regular basis to keep their skin clean. However, do not wash your dog too often as it can dry out their skin, causing friction and skin damage. Nutrition: Making sure your pet gets all of the nutrition they need is vital to their basic health. One result of poor nutrition could be a weakened immune system. This can leave your dog more vulnerable to skin conditions. Irritants: Exposure to irritants such as certain shampoos, detergents and other chemicals can be harmful to your pet’s skin and lead to growths. Try to avoid exposure to unnecessary chemicals to keep your dog safe. Your dog’s response: If your dog continuously tries to bite or scratch at a skin tag or growth, it may be causing them discomfort. Cuts: If your dog has cut a skin tag or growth, it can become infected and should be removed. Large growths: These can get caught on collars, brushes, or other objects. This creates a risk of the growth being torn and causing your dog harm. Changes to a growth: Changes in colour or size to any growths on your pet should also be checked out as soon as possible. Your vet might advise the growth is removed and analysed further to ensure that any serious health issues are diagnosed as early as possible. You should never attempt to remove a growth from your dog using home remedies. This can result in hurting your pet. Cryosurgery: A safe method of using extreme cold to destroy the growth. Argos Pet Insurance could help cover your pet for unexpected vet bills if they developed a growth or skin tag. Visit www.argospetinsurance.co.uk to find out more information about our policies.